by Chris Woodford. Last updated: April 14, 2018. Hearing is one of our most important senses because it alerts us to dangers we can't always see. You might not notice a lorry backing towards you, but if you hear the beep-beep-beep of a reversing alarm you'll look up and get out of the way. Hearing evolved in animals as an early-warning system, but for us humans it's so much more than that. We communicate largely by speaking and listening to one another and we listen to music so we can experience deep emotions whenever we wish. Imagine how frightening and isolating it can be, then, if you're unlucky enough to be deaf from birth or if your hearing starts to decline as you get older. Thankfully, science and technology—in the shape of hearing aids—can help many people who suffer from hearing problems. 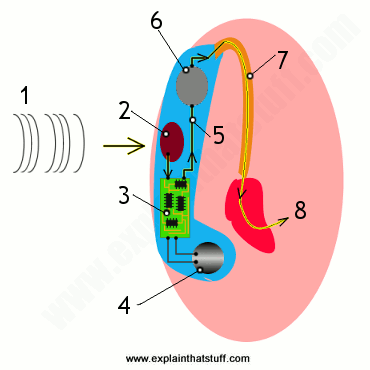 Let's take a closer look at hearing aids and find out how they work. Photo: A typical BTE (behind-the-ear) analog hearing aid (left), with its ear mold (right), and button battery (bottom). The ear hook, the other essential component that links the hearing aid to the ear mold, is not shown on this photo. Sound is simply a kind of energy we can hear. Things make sounds when they vibrate (move back and forth), setting air in motion around them. Think what happens when you bang a drum: the taut drum skin vibrates very quickly, pushing and pulling on the air molecules (atoms joined together) that are next to it. These air molecules move about more energetically and start crashing into other air molecules too. That's how waves of sound energy race out from a drum in all directions and that energy (the same energy you gave to the drum skin by hitting it in the first place) keeps traveling through the air until it reaches your ears. What happens then? The pinnae (big outer flaps) of your ears are shaped so they can gather sounds coming from different directions and funnel them into the ear canal (the hole that leads to your inner ear). 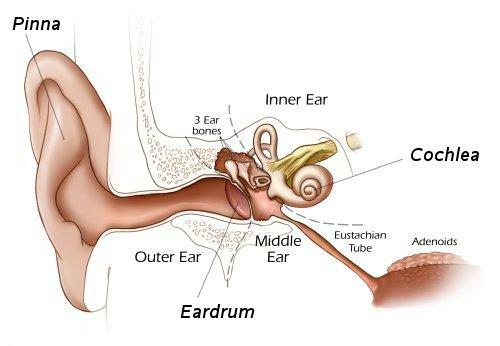 At the end of your ear canal, there's a tiny drum-like skin called the eardrum. When incoming sound waves hit the eardrum, they make it vibrate. Three tiny bones called the hammer, anvil, and stapes (or stirrup) in your skull detect those eardrum vibrations and pass them on to a snail-shaped organ called the cochlea, which is filled with fluid and tiny hairs called cilia. The sound vibrations make the fluid in the cochlea wash back and forth, agitating the cilia. The cilia detect those vibrations and send electrical signals to your brain, which you hear as sounds of different frequency. In short, then, hearing is all about sound energy entering your ears and being turned into electrical impulses by tiny hairs inside your cochlea. Artwork: Anatomy of the human ear. Hearing begins with the outer ear (pinna), but all the really clever apparatus that lets us sense and recognize sounds is actually concealed inside our skulls. Why do we have strange folds in our outer ears? They help us distinguish sounds coming from different directions. Picture by courtesy of National Institute on Deafness and Other Communication Disorders (NIDCD) and National Institutes of Health Photo Galleries. The path between your outer ear and your brain can be blocked or damaged in many different places and in a number of different ways, so people can become deaf or lose some or all of their hearing for lots of different reasons. One of the most common types of hearing loss happens when the hairs in the cochlea become damaged. If there are fewer hairs, sounds produce less stimulation in your brain—so things need to be louder for you to hear them. That's where hearing aids come in. They can't help everyone with impaired hearing, but they can often make a difference to hearing problems caused by a loss of cochlear hair cells, medically known as sensorineural hearing loss (SNHL). Photo: A BTE (behind-the-ear) hearing aid. You can clearly see the pink-colored case that sits behind the ear and the clear plastic tube leading to the ear mold at the bottom. Photo by Tyler W. Hill courtesy of U.S. Marine Corps. There's a tired old joke in television sit-coms where people shout at a deaf person (usually a deaf, elderly person) to make themselves heard. What happens if you shout at a deaf person is that you transmit sound waves of greater amplitude (volume) and energy into their ear canal. Their cochlear hair cells are more likely to detect these more energetic sound waves and, consequently, they're more likely to hear you. Old-style ear trumpets work a slightly different way. Effectively, they make the outer ear much bigger and concentrate the energy in incoming sounds into a smaller area. That increases the pressure that sounds make on the eardrum and, again, improves the person's chances of hearing. While shouting louder and using ear trumpets are crude, mechanical solutions to the problem of hearing loss, a hearing aid is a much more sophisticated electrical solution. 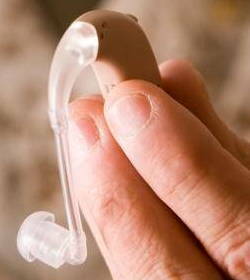 A hearing aid is simply an electronic sound amplifier. You've seen people on stage speak into a microphone and have their voices hugely amplified by giant loudspeakers so crowds can hear them? A hearing aid works exactly the same way, except that the microphone, amplifier, and loudspeaker (and the battery that powers them) are built into a small, discreet, plastic package worn behind the ear or just inside the ear canal. 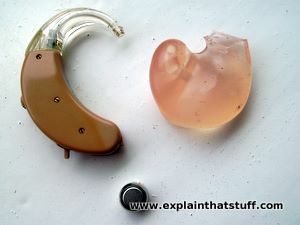 Photo: Hearing aids as they used to be. This Acousticon aid dates from 1925. You wore the top, headphone part over your ear. The bottom part contained the microphone, battery, and a control (left) for adjusting the volume. This is an exhibit at Think Tank, the science museum in Birmingham, England. One of the most common types of hearing aid is called a BTE (behind the ear) and consists of two separate pieces. Behind the ear, there's a hard plastic case that contains a small microphone, amplifier, and loudspeaker. This is linked, via a tube, to a softer plug called an ear mold shaped to fit just into the person's ear canal. When you wear a hearing aid like this, the microphone picks up sounds around you and turns them into an electric current, the amplifier (using one or more transistors) boosts the size of the current, and the loudspeaker turns the boosted current back into a much louder sound. This amplified sound flows through the tube and the ear mold into the person's ear. A different style of hearing aid called a CIC (completely in the canal) has all the same components but fitted into a small plug that pushes right into the ear canal. In between the two extremes of BTE and ITC, you can get somewhat larger hearing aids called ITC (in the canal) (which means partly in the canal and partly in the outer ear) and ITE (in the ear), which fill the canal and part of the outer ear but don't sit behind it like a BTE. CIC, ITC, and ITE hearing aids are now so discreet that you may not even notice someone is wearing one. Hearing aids come in two main kinds. Analog hearing aids simply convert sound into electric currents, boost the currents, and turn them back into louder sounds. Digital hearing aids are more sophisticated (and cost much more). They convert the sound into a numerically coded signal and, depending on how they are designed, process and refine the signal before turning it back into a sound. Digital hearing aids can be tuned so they emphasize sounds of particular frequency or block out unwanted noise more effectively, whereas analog hearing aids tend to amplify everything (background noises as much as important sounds) by the same amount. Although a hearing aid can never restore hearing completely, it can make a huge difference to a person's life by helping them converse more normally and enjoy everything from TV and radio to recorded music and birdsong. It's a great example of how science and technology (often much maligned) can really improve the quality of our everyday lives! 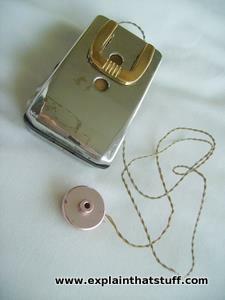 Photo: 1) This basic "body" hearing aid (probably dating from the mid-1950s to the mid-1960s) fastens to your clothes with the brass spring clip at the top or slips inside a jacket pocket. The microphone holes above and below the clip pick up sounds, which are amplified by the circuit inside and fed out through the earpiece (bottom). 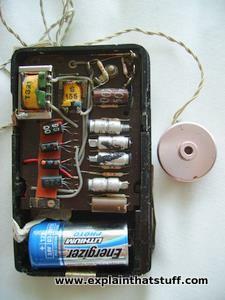 2) The circuitry inside is fairly simple. The most important components are the four amplifying transistors (black) on the left, which boost the sounds from the microphone. I haven't managed to identify the exact make and model, but the spring clip detail looks very like ones made by Fortiphone of London, England. Sound waves travel toward your ear (pink) and the hearing aid you're wearing behind it (blue). A small microphone picks up the sounds and turns them into an electric current. An amplifier circuit (containing one or more transistors) increases the strength of the current. A small button battery powers the amplifier circuit and other components. The amplified current drives a small loudspeaker. The loudspeaker plays its sound into a tube called the ear hook. The ear hook plays the sound through the ear mold into your ear canal. Sound waves of greatly increased volume travel to your inner ear. A digital hearing aid works in much the same way, except that the amplifier chip digitizes the sound signals from the microphone, then processes and filters them before it amplifies them—producing much clearer sounds. It can be much more closely tuned to your particular hearing difficulties and it automatically adjusts itself to different environments (noisy restaurant, quiet home, or wherever you might be). What you read up above was a hugely over-simplified explanation: hearing aids are much more than just basic amplifiers. For those of you who'd like more detail, here's an in-depth explanation of how real hearing aids actually work, how digital aids differ from analog ones, and why they cost so much more. What problems does a hearing aid have to solve? Conductive impairment: Sound doesn't travel properly ("conduct") from the outside to the inner ear. This can sometimes be corrected by surgery or simple amplification. Sensorineural hearing loss (SNHL): Generally a problem with the cochlea, in the inner ear, in which the cilia do not detect sounds of certain frequencies as well as they are supposed to. Most hearing impairments fall into this category, so this is the problem that most hearing aids seek to address. Neural impairment: A problem in the brain itself that affects your ability to interpret sound signals your ears have successfully registered (possibly caused by something like a brain tumor, stroke, or other brain injury). This is a relatively rare problem and not something that a hearing aid can address. The next thing to consider is that there are different types of hearing loss. With a sensorineural impairment, you might lose only low or only high-frequency sounds, for example, so you would need a hearing aid that amplified frequencies very selectively. Not only that, but in an environment where there are many sources of sound (someone talking over the sound of a jackhammer, perhaps), you'd want to amplify only the soft sounds that you can't hear rather than making the louder sounds painfully unbearable. Finally, you need a hearing aid to work in subtly different ways in different environments (at home, in a concert hall, on a busy street, or wherever you happen to be). How does a hearing aid cope with all these problems? In theory, a simple analog hearing aid is too crude to do all this. If a hearing aid were just a miniature microphone and loudspeaker, it would amplify all sounds by the same amount. That's not what most people with hearing difficulties actually want. When you have your hearing tested, the audiologist (the person who does the test) will establish the exact pattern of frequencies you can or can't hear, known as your audiogram. If you choose to have an analog hearing aid, it will be designed to boost some frequencies more than others to match your needs as closely as possible. Even so, if it's a basic analog hearing aid, it will still essentially boost all incoming sounds by a certain amount, so it will amplify irritating background noises as well as voices you want to hear—people chattering in the background as well as the TV program you're watching. The next level of sophistication is a known as a programmable analog hearing aid, and has various different settings you can select to give different kinds of amplification for different everyday environments. The settings are preset when your hearing aid is manufactured, according to your personal audiogram, and usually you have to select between them yourself using a small, discreet switch somewhere on the hearing aid. Although more sophisticated than basic hearing aids, programmable aids are still analog: they boost all incoming sounds without processing them in any intelligent way. Digital hearing aids, which have been widely available since the 1990s, are very different to analog ones: they analyze incoming sounds intelligently, do their best to figure out which sounds and sound frequencies you want to hear, and boost those selectively. Now there's nothing automatically superior about digital technology: there are many audiophiles who swear that analog record players have superior sound quality to digital CD players, while lots of photographers still prefer analog film cameras to digital cameras. What makes the difference is that digital music or digital photos can be processed in all kinds of ways that are much harder with analog information—so you can quickly and easily remix music on your computer, digitally enhance your photos, and so on. In much the same way, digital hearing aids aren't superior to analog ones because they amplify sounds better—analog aids may, in fact, do that job just as well—but because they turn sounds into digital information that can be enhanced to make speech that's easier to understand, music that's more pleasant to listen to, and so on. Compression: This is a key feature of digital hearing aids. Although it's complex, and there are numerous different kinds, the basic idea is simple. A person with normal hearing can hear the full range of loud and soft sounds (from falling leaves to jets screaming overhead) for all frequencies, but someone with a hearing impairment will hear a smaller range of sounds for certain frequency bands (they will only hear sounds of those frequencies if they're loud). What a hearing aid has to do is squeeze (or compress) the range of loud and soft sounds in the world around us into the much smaller range that the patient can actually hear, while taking account of the fact that they can hear some frequencies better than others and will often want to hear certain frequencies (particularly those of speech) more than others. WDRC (wide dynamic range compression) is a particular type of compression that boosts the softer sounds you want to hear (including speech) much more than louder ones you don't want to hear. Using broad frequency bands called channels, it takes account of the particular pattern of frequencies you can and can't hear. It also adjusts for the way sounds "dynamically" change in intensity from when they begin to when they end. Examples of WDRC include BILL (bass increase at low levels, which is designed to make speech easier to hear in noisy environments) and TILL (treble increase at low levels, which selectively boosts high frequencies for people with that pattern of hearing loss), which are often combined into what are called multichannel hearing aids. Sound classification: This categorizes the sounds you can hear into music, speech, noise or whatever and amplifies them (or reduces them) selectively. Sophisticated hearing aids effectively figure out what kind of environment you're in (concert hall, noisy restaurant, lecture theater with distant speaker, or whatever) and apply a different amplification pattern to the sounds you're hearing. Effectively, they're working like sophisticated programmable analog aids but switching themselves automatically according to the environment you're in. Speech enhancement: This selectively boosts sound frequencies in the range from a few hundred to a few thousand hertz, which carry most of the energy in human speech. Feedback reduction: Hearing aid users have to suffer two kinds of feedback: acoustic and mechanical. Electrically amplified sound suffers from acoustic feedback: if you turn the volume up too much, the amplified sound enters the microphone with the original sound, gets amplified, enters the microphone again, and so on until you hear a horrible, deafening whistle. That happens with hearing aids as well as electric guitars, though digital hearing aids can tackle it more effectively than analog aids (where the only solution is to turn down the volume). Digital hearing aids can also remove mechanical feedback noise from such things as jaw movements. Noise reduction: This works a bit like the noise reduction buttons on old-fashioned cassette tape recorders or (noise canceling headphones) to remove steady background noise (such as hiss or low-frequency vibrations on airplanes and trains) from the "signals" (speech sounds or music) you actually want to hear. Are digital hearing aids better than analog ones? In 1999 Professor Stig Arlinger (one of the pioneers of digital hearing aids) and Erica Billermark of Linköping University studied about 30 people who had switched to digital hearing aids one year before. They found people used their hearing aids twice as much compared to their previous analog aids and their ability to recognize speech gradually improved by up to 25 percent . In 2001, David H. Kirkwood noted that "More than three-quarters of respondents to the [Hearing] Journal's eighth annual dispenser survey reported that their patients were more satisfied with digital signal processing (DSP) instruments than with other advanced non-digital hearing aids," with high satisfaction on sound quality, understanding speech in noisy environments, listening comfort, and preventing feedback . In 2003, Donald Schum and Randi Pogash did a blind comparison (in which patients had to test different aids without knowing which was which) and found 74 percent preferred second-generation digital aids to less advanced digital or analog ones . In 2005, Sergei Kochkin of the Better Hearing Institute compared customer satisfaction with digital and analog aids and found a preference for digital in almost every respect, including overall customer satisfaction (77% / 66%), clearness of tone (80% / 68%), ability to hear soft sounds (70% / 56%), feedback (63% / 46%), use in noisy situations (57% / 42%), and almost every type of listening environment . Since digital aids cost more, they can be sold more profitably, and that risks their benefits being overstated or "overhyped" by private hearing clinics. There's no sure way of knowing whether a digital hearing aid will be better for you—unless you try one and see. And if you never try one, you'll never know! One year follow-up of users of a digital hearing aid by S. Arlinger and E. Billermark. Br J Audiol. 1999 Aug;33(4). p223. Most dispensers in Journal's survey report greater patient satisfaction with digitals by David H. Kirkwood. The Hearing Journal, Hearing Journal, March 2001, Volume 54, Issue 3, p21. Blinded comparison of three levels of hearing aid technology by Donald J. Schum D and Randi R. Pogash. Hearing Review, 2003, Volume 10 Issue 1, p40. MarkeTrak VIII: Customer satisfaction with hearing instruments in the digital age by Sergei Kochkin. The Hearing Journal, September 2005, Vol. 58 No. 9, p30. National Institute on Deafness and Other Communication Disorders: A useful list of frequently asked questions. Action on Hearing Loss: A good set of background briefings. Includes lots of completely objective, very helpful information on buying hearing aids from the UK's leading deafness charity. Hearing Loss Association of America: Practical tips for getting yourself a hearing aid. The Hearing Aid Museum: A nostalgic look at how technology has (thankfully) evolved over the last few decades, including lots of great pictures of early hearing aids. Why Are Hearing Aids So Expensive? by Karen Weintraub. The New York Times, October 20, 2018. Are cheaper hearing aids likely to appear anytime soon? Using the Inner Ear's Biological Battery by Emily Waltz, IEEE Spectrum, November 8, 2012. Our ears have built-in chemical "batteries," but could we use them to power hearing aids and save the need for all those tedious replacement batteries? A Historical Perspective on Digital Hearing Aids: How Digital Technology Has Changed Modern Hearing Aids by Harry Levitt, Ph.D., Trends in Hearing. 2007 Mar; 11(1): 7–24. A great review of the development of modern digital aids, which traces the technology back toadvances in signal processing made in the 1940s. Digital Hearing Aids: Hype, Hoax or Hope by Robert E. Sandlin, Ph.D., Audiology Online, July 2, 2001. The Ear Book: A Complete Guide to Ear Disorders and Health by Thomas J. Balkany and Kevin D. Brown. Johns Hopkins University Press, 2017. A good basic primer to help intelligent patients understand a wide range of ear disorders (including various kinds of hearing loss, swimmer's ear, tinnitus, and balance). Sound: A Story of Hearing Lost and Found by Bella Bathurst. Profile, 2017. An engaging personal story of hearing loss. An Introduction to the Psychology of Hearing by Brian C.J. Moore. Emerald, 2012. Another introductory text on psychoacoustics, mainly intended for undergraduates. I recommend Professor Moore's books very highly: he was my own (excellent) lecturer in hearing when I studied the subject, some years ago. Fundamentals of Hearing by William A. Yost. Brill, 2013. Introductory textbook for psychology and medical students. Hearing by Brian C.J. Moore (ed). Academic Press, 1995. Hearing Aids by Harvey Dillon. Thieme, 2012. Comprehensive practical overview of hearing aids for professionals. Digital Hearing Aids by Arthur Schaub. Thieme, 2008. A great introduction to digital aids, covering topics such as signal processing, directionality, noise reduction, and compression (especially WDRC) in detail. Hearing Aids: Standards, Options, and Limitations by Michael Valente. Thieme, 2002. Another practical guide aimed at people who have to measure hearing and choose the best aid for a particular patient. Includes many diagrams and charts. Textbook of Hearing Aid Amplification by Robert E. Sandlin. Cengage, 2000. Another useful introduction to the theory of how hearing aids work, with good coverage of topics like compression. However, some details are now dated and the latest technologies aren't covered.